When: August 1st, 2010 (age 44). 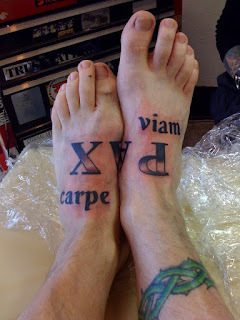 What/Where:3 latin words: The phrase "carpe viam" and the word "pax" -- on both feet. Time? Took around 3 hours to find the right fonts, do the drawing and design, then about 1 hour of "buzz time." 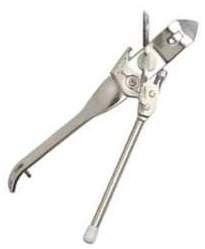 Pain: It was weird -- in my previous work, it was painful at first and took awhile to change. With my feet the pain faded almost immediately. When she went back and did the fading and touch-up, that was hard at first, but that too faded quickly. The most difficult part was the two halves of the A in PAX -- it was in some real tender flesh and sort of half-hurt and half-tickled. Very weird. Why: So that with each step I take, I am reminding myself to "seize the path" and offering "peace" to all whose path I cross. very nice, you impress and inspire me, thanks. I like. 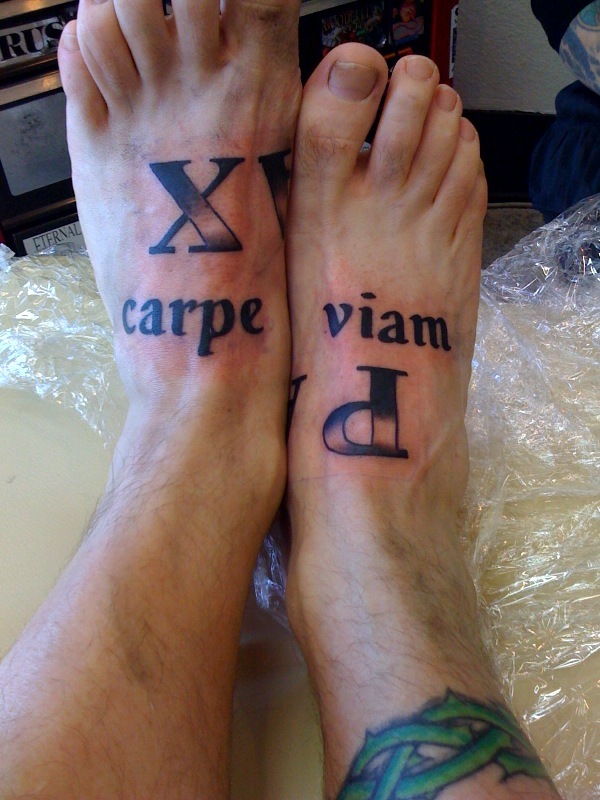 Nice alternative to carpe diem. Also, the offsetting makes for cool metaphors -- foot always going forward.